Daylight savings time is in use in most northern latitudes, while darkness now arrives earlier in the south. The Big Dipper (The Plough) is high in the northern sky, Leo is prominent from all latitudes, and the Milky Way, containing a wealth of bright stars, is well placed for those in the southern hemisphere. Bootes is an elongated constellation depicting a man herding a bear, represented by Ursa Major. The name of its brightest star, Arcturus, is Greek for (bear guard). The northern part of Bootes contains the faint stars that formed the now-defunct constellation of Quardrans Muralis, the mural (or wall) quadrant, which gave its name to the Quadrantid meteor shower that radiates from this area every January. The brightest star north of the celestial equator, and, at magnitude -0.1, the fourth brightest overall. It is a red giant, 100 times more luminous than our Sun but with a cooler (and hence redder) surface. To the naked eye, it has a noticeably warm tint, which becomes stronger when it is viewed with binoculars. A beautiful double star but a difficult one to divide. To the naked eye, it appears of magnitude 2.4. A telescope of aperture 3 in (75 mm) or more shows a redgiant primary and a close, blue-green partner of 5th magnitude. High magnification and a steady night are needed to separate the stars. A double star, easily divided with a small telescope into a pair of white stars of 5th and 7th magnitudes. A multiple star. Binoculars show a wide double, with stars of magnitudes 4.3 and 6.5. The fainter star is itself double, with 7th- and 8th-magnitude components that orbit each other every 260 years. They should be divisible in moderate apertures, but are just too close to be split with a small telescope. A double star, divisible with a small telescope. The stars, of magnitudes 4.7 and 7.0, are both yellow-orange, one slightly deeper in tone than the other. They form a true binary with an orbital period of 152 years. Corvus is a small constellation south of Virgo that represents a crow. A double star, with components of widely different brightness. The brighter star, of magnitude 3.0, has a 9th-magnitude partner, which is visible through a small telescope. A famous pair of interacting galaxies. They are small and of 11th magnitude, so a telescope of moderate to large aperture is needed to see them. Long-exposure photographs show two streamers of stars and gas that extend from the colliding galaxies like the feelers of an insect, giving rise to the popular name. The brightest star in the Southern Cross, known as Acrux or Alpha Crucis, is in fact a close double star. A small telescope will divide it into two sparkling points. A fainter star, which is not related to the main pair, can be seen through binoculars. This open cluster, popularly known as the Jewel Box, is visible to the naked eye as a hazy star, and is best viewed through binoculars or a small telescope. The English astronomer Sir John Herschel described it in the 1830s as resembling a casket of variously colored precious stones. Although it appears to lie next to the Coalsack it is in fact over 12 times more distant. What appears to be a hole in the Milky Way next to Crux the "Southern Cross" is in fact a huge cloud of dust that blots out light from the stars behind it. This Dark Nebula, known as the Coalsack, is about 60 light-years in diameter, and is thought to lie about 600 light-years from us. 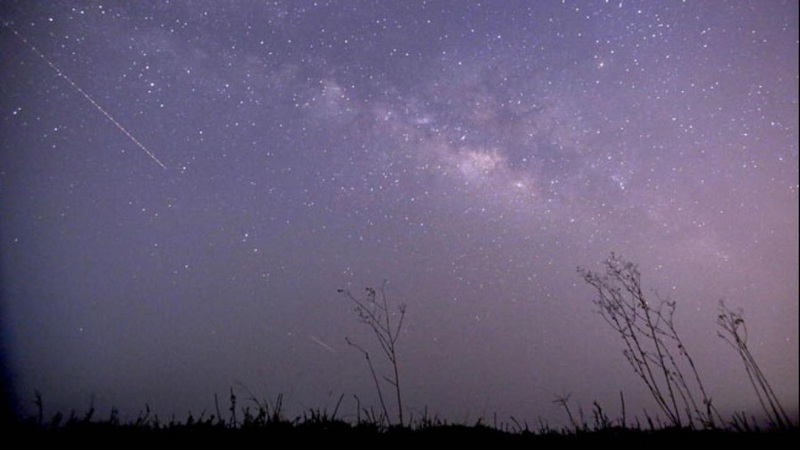 The Lyrid meteor shower, most easily seen from northern latitudes, reaches its peak around April 21st. It is one of the poorer showers, with a maximum rate of only 10 meteors an hour, but the meteors are fast, bright, and often leave trains. The radiant is in the constellation Lyra, close to the bright star Vega.